Ernie Ball Slinky strings are of the highest quality. They're the favorites of famous artists like Eric Clapton, John Mayor, Slash and Steve Vai. The strings are made highest standard to create an optimal performance and a long life time. For the electric, acoustic and bass guitar. 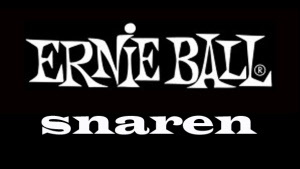 Gitaarsnaren van Ernie Ball, Electrische gitaarsnaren van Ernie Ball, Gitaarsnaren van Ernie Ball voor akoestische gitaar, Gitaarsnaren van Ernie Ball voor electrische gitaar, Gitaarsnaren van Ernie Ball kopen.